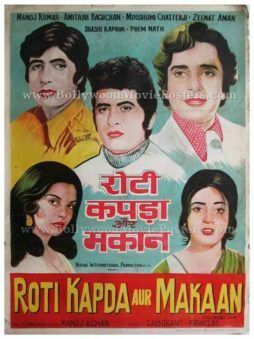 Old hand drawn Bollywood movie poster of the blockbuster Hindi film, Roti Kapda Aur Makaan (1974) for sale. Roti Kapda Aur Makaan also boosted superstar Amitabh Bachchan’s film career, who at the time was looking to make a mark in Bollywood, making this poster highly collectible! Printed and circulated a few years after the original first release run of the film (somewhere in the late 1970s), this old hand painted Bollywood poster was designed and printed for publicity of the film but never ended up being used. This poster was originally designed on a hand painted canvas by a small time poster design studio in Delhi, giving it a very quirky appearance. A quirky portrait of Manoj Kumar is seen at the center of the poster, signifying his lead presence in the film. He is flanked on either side by supporting actors Shashi Kapoor and superstar Amitabh Bachchan. This old Amitabh movie poster features the superstar painted in a dull white avatar with deep red lips. This poster has been graded as ★ As Is due to tattered borders, small missing pieces as well as visible water stains seen clearly in the photograph. Please study the accompanying image carefully before making a purchase.